Last year I wrote that my Chinese pronunciation sounds like my boyfriend’s. That is because I mainly speak Chinese with him and less with other people. So this time you can actually hear how my putonghua (Mandarin Chinese) sounds like! I know it is far from standard Mandarin because I live in Guangzhou and people around me doesn’t speak it either. After listening please leave a comment and tell me what you think. How bad is it and did I miss all the tones? Can anyone even understand what I’m reading on the audio clip? If you have any advice how to improve my pronunciation I am more than ready to listen! Could buying a fake bag be an ethical decision? Thanks Anuliina! You maybe wouldn’t be that impressed if you would understand :) It’s still quite hard to admit that I actually can speak Chinese. Of course far from fluent but still can have a whole relationship with only that language. What I read was a beginning of a story in my Graded Chinese Reader. That’s a short story collection for foreigners learning Chinese, the language is more simple than in native level books. The first chapter I read is about Chinese New Year. Nice to hear that it sounded cool to you :) This reminds me of one day when I was working in the museum and two girls came in. The other was Japanese and the other Finnish. They were speaking in Japanese and even I don’t understand anything about that language, it felt so impressive that the Finnish girl seemed speaking so fluently! Nice to read your comment Frank! And good to hear that you understood me. My boyfriend really does have an interesting putonghua accent and actually we speak Chinese all the time because that’s the only language we can communicate in. He really have helped me with my spoken Chinese, but isn’t the best example for pronunciation. But you are right that no one speaks like a radio and that isn’t my goal either. I hate to be the one who doesn’t agree with everyone else and perhaps I have too high of a standard. Anyways, I could make out most parts of what you were reading about (the spring festival and lian lian you yu). There are words you have very good pronunciation but there are definitely some parts sounded like Cantonese more (which reminded me of how my dad would speak mandarin sometimes). Perhaps you should seek out some friends who are northerners and have them help you? Best of luck! Don’t worry Sean, this is absolutely what I wanted! The honest the better. I also understand very well why some of my speaking sounds like Cantonese and agree with you. I guess I could try to find a student form my university that is from the north and ask if he/she would like to be my tutor. I have a big plan working really hard with my Chinese the next two months before my trip to Finland and this improving my spoken Chinese should definitely be part of it. Well, I am glad my comment was well received! Have you tried to listen to music in Mandarin? When I learned my English, that’s how i did it. I would imagine the reverse would work as well. It works with my girlfriend. It’s been years since she been to China and that’s how she keeps up with her Mandarin. Sean, I was prepared for much worse :) And honest answer is what I need so I know what I should do to improve my pronunciation. I listen to Chinese music sometimes, but not too often. Maybe I should try to trun on the music when I’m on the computer and see if that has any help. Any music recommendations? I’ve used to listen to Jay Chou 周杰伦 but many people tend to think that his own pronunciation is quite special too. Is that so? You sound like Shanxi dialect! That’s interesting NN :) I’ve actually been to Shanxi, Pingyao, once but only for two days. Ni de zhongwen hao de duo a! Oman äänen kuunteleminen on aina kamalaa. Mä joudun kerran tekemään radiomainoksen ja se oli yks noloimmista hetkistä mun elämässä. :D Mut sun ääni ei kuulosta yhtään hullummalta. Enkku kuulostaa hyvältä! Thanks for your recommendation T! I’m really a terrible singer and don’t want anyone to suffer from hearing me :) Youtube is quite slow for me, but I’ll try to watch that. I noticed a basically Finnish accent with some definite Cantonese influence – all of which is fully understandable. Some tones were missed, but I think intonation, as in the rhythm and pitch, is more problematic. Having said that, my wife (native speaker) and I (learner) understood perfectly. There is no problem here that could pose a barrier to communication, and more practice I’m sure will see improvement. As for Sean and his “some parts sounded like Cantonese”, I notice he wrote “lian lian you yu” for “年年有余”. Thank you very much for your opinion and advice Chris! I’m really happy to hear that you both understood me. In my daily life Chinese people usually understand me too. So I think that with more practice and probably a tutor from the north would do good to my pronunciation. p.s. Last year I had a teacher with this similar problem. She always said leng when she meant neng 能. Also some Cantonese people can’t sai R so when I heard “you yen” it took me a moment to understand that the fitting room “you ren 有人”. Also at the beginning I couldn’t always understand if my boyfriend said hungry “e” or hot “re” because it sounds little bit the same without an R.
Thanks again for your effort Sean, and for you girlfriend’s too. I will definitely look them up from kugou. R sound isn’t in the Cantonese dialect. Also sounds that start with sh have become s for Cantonese. There is a sound shift to l for words starting with n in cantonese. Thanks for sharing this information Stanley. I didn’t know about this sound shift from n to l, but I can very well understand that native Cantonese have a Cantonese accent when they are speaking putonghua too. Hi,Sara. After listening 5 times, I finnally figured out what you said at the beginning,did you say something like ｉｎ　ａ　ｃｉｔｙ　ｏｆ　ｓｏｕｔｈｅｒｎ　Ｃｈｉｎａ? Then I listened more of what you read,I found you were getting better on the pronuncing. Check out this web site-http://www.livemocha.com/ You ‘ll find more people to listen to your reading and get corrected,which is helpful. I learned Hebrew from that site. Hi anonymous! The beginning goes like this: 在中国南方的一座城市里，有一条街叫香椿树街。I’ve heard about Live Mocha but haven’t tried it my self, maybe I should take a look! And thanks for your effort for listening 5 times. Sorry,I forgot to rate. If ‘excellent’ is ’10’ for this phase which you are in, you’re getting ‘8’. Really? 8 out of 10? I was prepared for something much worse! Sara, I could understand most of what you read. I am not sure about the putonghua thing. Although I am a Chinese, my Mandarin is not good. Here in Malaysia unless you go to a Chinese venacular school, the medium of instruction is Malay and English at one time. But nevertheless, bear in mind that the main thing about language is to be able to communicate and be understood, unless of course you wnat to master it. But I am impressed that you try and you are doing fine. One day, who knows, you may be as good as CCTV’s Charlotte and Da San! Every thing I hear them speak,I feel ashamed of myself. They really impress me. I absolutely agree that the most important thing is to be understood. And luckily I’m usually being understood in my daily life with other Chinese people. Now I have to admit that I haven’t heard Da Shan speaking! I guess I should go to youtube/tudou right now to listen him. I think your Chinese sounds great Sara! I think it would be a great idea to continue posting audio clips of you speaking Chinese every once in a while so your readers can follow your progress on your Chinese speaking abilities. Tärkeintähän on,et tulee ymmärretyksi. Itselläni on paha yunnanin aksentti, ja minulle on kerrottu monta kertaa, et pitäsisi mennä Pekingiin opettelemaa puhumaan. Miksi? Asun Yunnanissa, joten ymmärrän paikallista puhetta vallan hyvin, ja joudun välillä tulkkaamaan jopa kiinalaisille. Tärkeää mielestäni on vaan itsensä ilmaiseminen, vaikka kiertoilmaisuin, kun/jos ei sanavarat riitä. Olen kehittynyt selittämisessä yllättävän hyväksi. Loppujen lopuksi asian helpoksi minulle tekee se, ettei kiina ole perheeni tai minun äidinkieleni, joten esim. toonien kanssa ei ole niin väliä. Tärkeintä on, että yritämme ymmärtää toisiamme. Olen samaa mielta, etta selittaminen on erittain tarkea taito. Itsekin olen paassyt tata taitoa harjoittamaan aika laajasti viimeisen vuoden aikana kun oli loydettava keino keskustella poikaystavan kanssa asioista, joita en osannut sanoa kiinaksi. En voi myoskaan katsoa kaikkea sanakirjasta, eika siina olisi mitaan jarkeakaan. Joten selittamalla kylla yleensa vaikeampikin asia tulee ymmarretyksi ja tarvittaessa elekielta paalle. Itse toivoisin, etta aantamykseni olisi sellainen, etta mahdollisimman moni ymmartaisi. Toivon, etta myohemmin saisin kayttaa kiinan kielta tyoelamassa, joten sen puolesta erittain vahva aksentti voisi olla haitta tai ainakin hidaste. Miten siella kiinalaiset suhtautuvat siihen, etta tulkkaat heille paikallisten puhetta? Ihmettelevatko sita, etta voivat tarvita ulkomaalaisen apua paikallisten kanssa kommunikointiin? I‘m a native Cantonese. Speaking a language with any accent is really not a problem at all. English is spoken everywhere around the world, and people are speaking it in different accents. You don’t hear people talking to each other in BBC English! Mandarin is official language in China,based on the dialect of Beijing, actually,a lot of people in Beijing are speaking in Beijing dialect instead of proper Mandarin. As more and more HongKong super stars like moving to mainland to expand their career, Cantonese accent is getting welcomed. I haven’t heard anyone from the north saying that he/she doesn’t understand what Jacky Chen says in Mandarin. We all know the fact that all the languages are changing , someday,all the Chinese ‘d get used to ‘sh’,’s’,’n’, ‘l’, Maybe ‘ lian lian you yu’ ‘d be used more often by people in the future. Nobody speaks a language which was spoken thousands years ago. (No offence to the standard Mandarin speakers). People are speaking Cantonese with accents in GuangZhou,too. Cantonese originally came from a place-called ‘xi- guan'( now is part of li-wan ), The cross- cultured living adds accents to Cantonese dialect, I never see any Cantonese making a big deal on it. A lot of people in Guangxi Province are speaking Cantonese as their first language. Do you know that Cantonese almost became the official language in China during “Sun Yat-sen” times, but considering the inconvenience for the northerners to learn a new language, “Sun Yat-sen” government decided to get the Southerners to learn Mandarin. (aha,he thought the Southerners were smarter, considerable.–a joke). I read an article about this on a newspaper sometime ago. I’m quoting it just to let you be happy about what you are doing on your Chinese learning and your relationship. Again,no offence to all the Mandarin speakers ,Mandarin learners,Mandarin lovers. Speaking with an accent isn’t a problem as long as other people understand you. In the future I would like to use my Mandarin Chinese skills at work and that’s why would like my pronunciation to be easy to understand to as many as possible. But sure there isn’t any need to be perfect, even that would be possible. My English isn’t perfect either but people still understand me well. But I have to admit that English with a really strong Scottish/Australian/Chinese/Indian accent is sometimes hard for me to understand. you pronounced 南方 (nán fāng)like nèn fàng, 有一条（tiáo）叫街(jiē)香(xiāng)椿（chūn）树街(jiē), you sound like 有一条（tiào）街(jiè) 叫香(xiàng)椿（zōng）树街(jiè),春节(jié)快要到(dào)了, you sound like 春节(jiè)快要到(dáo)了,开始（shǐ）, you sound like 开始（xǐ）, 生（shēng）活 not 生（shèng）活, and the rest part sound quite good!!! Thank you Zacky for this list! I’ll keep these in my mind. I’ve also started to watch more Chinese TV in order to help with my listening, but also with my tones and pronunciation. At the beginning I can have memory tricks to remember the tones etc but now and later on I think the key is to listen a lot. And besides music, listen to a normal speach from news and TV shows. Jackie, luckily Cantonese did not become the official language of China. It is rough, loud, pugnacious and lacking in finesse. No offence meant, it just sounds that way. I watch Cantonese films too. And I must say for action movies Cantonese sounds better. But for eveyday conversation, I am not too enamoured with it. Sara, do not become discouraged. If everyone speaks putonghua, imagine how boring that would be. The world is interesting only because people are different and they speak different languages. And even with the same language, different people speak it differently. The thing is, if people can understand what you say, what is the fuzz all about? Don’t worry, I’m not getting discouraged at all. Actually this feedback have been better than I thought. Or maybe you readers are just too nice to me? I will continue improving my pronunciation, but at some point it will be good enough for me and I can concentrate that time to some other aspect in Chinese language. ordinary malaysian, there are way too many homonyms and words ending with vowels in mandarin even though it makes mandarin sound very smooth. Cantonese has more words that end with consonants which mean the dialect will sound rougher. Cantonese also has a precise grammar. Have you met any bejingers? they speak like they’re in a musical play. it’s quite lovely every time i hear them talk, it’s like poetry of the waterfall flowing like the movement of silk with all the “rrrrr”s rolling out of their town. and alot of “sh” sounds. they do sound like confucius scholars lol. Cute? Thank you C! I’ve been to Beijing last year for two weeks and their accent sure is different than down here. But I’ve also got used to the southern way of speaking and doesn’t really miss the R sounds. Stanley, thanks for enlightening. Cantonese has it own beauty no doubt, except that for me at least, Mandarin sounds easier on the ears. No offence meant. Like I said, the world is interesting because there are differnt people and different languages and dialects and different people speak dofferently even if they speak the same language or the same dialect. Oh no, you are being way too nice Zee! :) I think I understand what you mean and will try to practice my t’s and tones more. Luckily I have one really excellent teacher here that always corrects our pronunciation and tones. great post! i believe that you can speak fluent chinese one day. And by the way, your new forum, it is very interesting. I have joined it and may i join it? Haha. Thank you Harrist. Sorry, the forum is only for women ;) Many guys have asked me to join the community, but the point to creat that forum was to have a safe place for us women to talk about our life in or our experiences about China. I asked my Chinese husband to comment on your recorded word and he said “Are you sure she is not a Chinese? :-) I guess it’s his way of saying, very good. Really Teerza? I could hug your husband right now (if you don’t mind) for his kind words! Very good, despite some minor problems in the intonations it’s mostly understandable.I’m Chinese myself now having my bachelor degree in Australia and I’m teaching Chinese in spare times. I’ll be happy if you send me emails for tips in Chinese learning. Nice to hear your opinion Tian! I will soon contact you via email. Thank you for your evaluation Eric Zhang! At this point I’m very happy that you could almost totally understand me. But sure in the end I want to be understood without efforts so this feedback is really important for me. Do I have problems with some certains tones or just with all of them in general? Kiitos Bo Pang! My teacher have also told me to pay attention to c and z, ch and zh. I really appreciate your opinion and always love to have feedback from a native Chinese speaker. Thank you! Hi Sara, it seems like you have problems with the second tone. For example in 南方， “南” should be second tone, but it sounds like a third tone, I think. 人们 the “人“ sounds like a fourth tone when you said it, but again, it should be a second tone. I had trouble with it too, for example, 南京 of course is pronounced “nan2jing1” but when I went to Shanghai, I told the taxi driver “nan3jing1lu4” and he quickly corrected me. I used to live in 浙江省温州市 and their Mandarin pronunciation is even less standard than the Cantonese, so I had to learn to listen to tones first, and forget about pronunciation if I was going to understand anything. Because of that, I think I’m pretty good with tones, for a Westerner. Thank you so much for your help Bobby! It’s overwhelming how helpful everyone have been and giving me so much advice. It’s also comforting to hear about other laowais who have had problems with the tones but have managed to master them. Makes me want to study harder so thank you! You could emphasize the first (really sing it on a high note), second (start in the middle and go up) and third tones (start low, go lower, come up a little) more. Before reading the text you could use a pencil to mark the tones on the characters. Thanks for the tips Bob! I’m planning on making a new audio or even a video soon to find out if there’s been any improvement. I am a Chinese. Your chinese is very good and I can completely catch it. The pron. sound has a taste of south of china. The speed of your speaking may be a little bit fast. The tone is too smooth and soft. I have some advices: your mouth open more large, slowly speaking and weighting tone. Generally, speaking need a short break before each chinese word. More practice makes perfect. The difference of chinese and western langu. is the syllable. One chinese word is only one syllabe, but western lang. is mutiple syllables in one word. So your mouth must be bigger and speed is slower when you speaks in chinease. I think this is the first time someone called my accent cute! You sound like The Google translator. That sounds like a very bad thing. :) First time on your blog and I’m eating up all the content ! It’s great to see someone else’s view of China… how we all go through pretty much the same process. 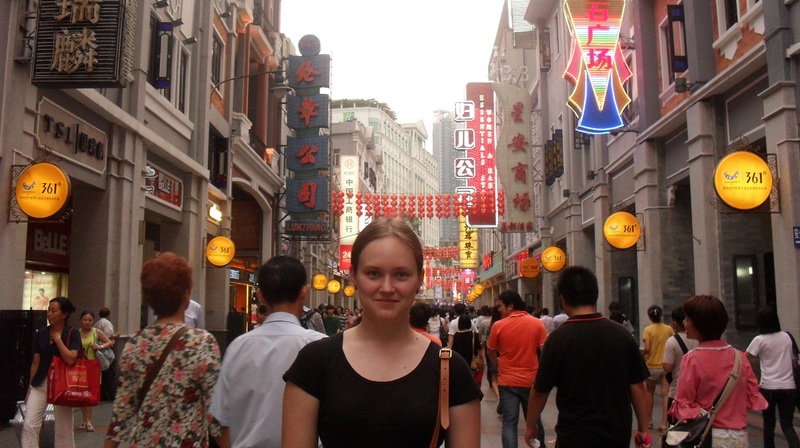 I actually arrived in China around the same time you did, March 2010. But I have been back in Mexico for a year now, my dream only lasted 2 years. Still, I miss so many things, and I feel like a part of me will always be in China, so I can easily relate. I think your chinese is impressively good (I would say you still miss some tones, but that probably comes from the fact that no cantonese speaking person actually gets them right ^^) (Not that my chinese is any better…) What I found really interesting, is that (admitting that I have never spoken to a finnish person, at least that I recall) your english sounds, to me, like spoken by a Chinese ^^ (In no bad way, just interesting). Well, good luck in your further experiences, i will meanwhile keep on reading on your posts. Thank you so much for you comment! I think I should record a new audio soon as it’s been a long time since this one. I’m also taking a new course in the uni about correcting my pronunciation, it would be great to track that too. I can understand very well that you miss China. I don’t know what would I do if I were to leave China one day. February 24, 2011 ？how about your spoken Chinese now?